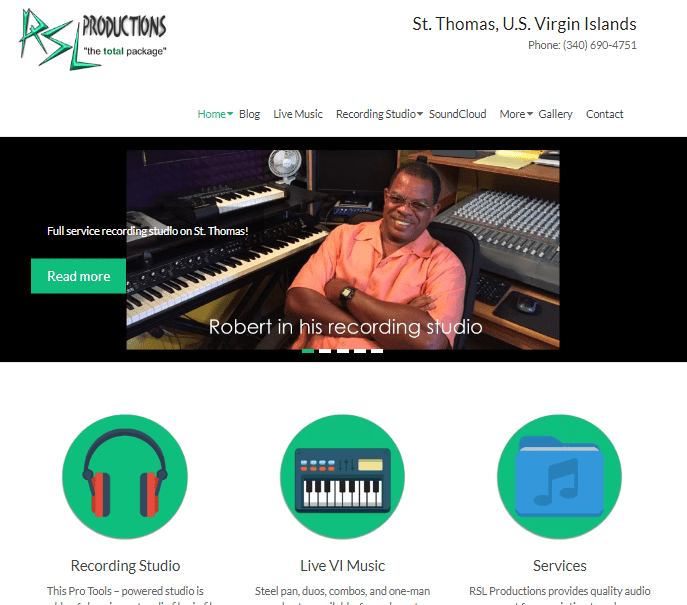 ST. THOMAS, U.S. Virgin Islands – Robert Anthony Leonard, a longtime fixture on the U.S. Virgin Islands music scene, has announced the launch of his newly-updated website, at www.rslvirginislands.com. The fresher look and feel were implemented in preparation for the upcoming Fall 2018 season. Leonard’s music career spans over 2 decades, and includes stints with the original Jam Band, Pearls Band, and Deep Unda Kova; band leader for Calypso tents and Pistarckle Theater; musical arranger and song producer for USVI, BVI and Caribbean Calypsonians, as well as voice and video talent for local and national ad agencies. The revamped site offers simpler navigation and easier access to information about the RSL Productions recording studio and live music from On Target Band, as well as sound system, arrangement, talent, and other services. Visitors are invited to register to receive site updates via its built-in blog, and follow Robert on Facebook with the handle @OnTargetBand.